If you are a resident of, or frequent visitor to, Utah, something you will experience at meals are dessert salads. What exactly are dessert salads? 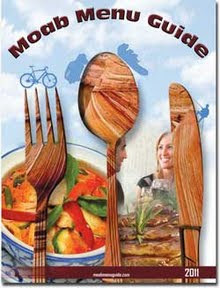 Side dishes made with Jell-O (gelatin and/or pudding), whipped toppings, fruits, vegetables, mayonnaise, sour cream, even pasta. These salads are served at buffets, in cafeterias, potlucks, parties; basically any type of gathering where food will be served, even funerals. Easy to be prepared ahead of time, holding up well during transportation; even though there are sweet ingredients, these dishes are classified more as salads, but make great desserts as well. Hence, the term, “dessert salad”. Now I’ve read in personal stories, and heard personal tales, of Jell-O being the number one “food group”, not just for Utahns, but for Mormons in general. It is not unusual for every good Mormon woman to have, in her recipe book, at minimum, ten Jell-O based recipes. I am definitely not sure of the truth of this, so did some historical digging about Jell-O. In 1845, industrialist, Peter Cooper (built the first American steam powered locomotive, The Tom Thumb) invented a powdered gelatin. However, 1897 saw New Yorker (yay NY!) cough syrup manufacturer, Pearle Bixby Wait, trademark a gelatin product he and his wife, May, called “Jell-O”. They added fruit flavoring to granulated gelatin and sugar; and a new dessert was given life. In 2001, Jell-O was designated, by Utah Legislature, the number one snack food of the state; our tax dollars at work! However, media food analysts found very little mention of the product between 1969 and 1988; in fact, it was written that Lutherans were the biggest lovers of Jell-O. That changed in 1997 when Kraft Foods introduced “Jell-O Jigglers” to the market; sales figures revealed Salt Lake City to have the highest per-capita Jell-O consumption. At that time, comedian Bill Cosby was the spokesperson for the much loved product and stated to the 2001 Utah Legislature, “I believe the reason people in Utah love Jell-O is that the snack is perfect for families -- and the people of Utah are all about family.” …and this is how we get to the first sentence of this current paragraph. The recipe I am giving you is for “Pretzel Salad”, a combination of fruit laden Jell-O with cream cheesy decadence over buttery, crunchy pretzels. Actually, I will be doing the story about Dessert Salads in several parts to show the variations; and who knows, you might be serving a new creation at your next get-together. Combine pretzels, sugar and butter together; press into the bottom of a 9” x13” glass baking dish. Bake for 10 minutes, remove from oven and cool completely. Combined the cream cheese with sugar; whip until smooth; fold in the Cool Whip. Spread this mixture evenly over the top of cooled pretzel crust, and seal all the edges. 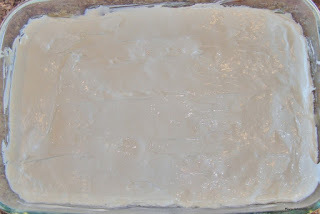 Place in refrigerator for a half hour to slightly firm up. 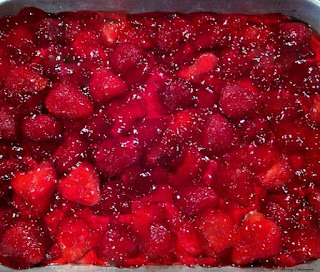 Combine the Jell-O and water; stir until gelatin is dissolved; add in the frozen strawberries and allow to thicken slightly. 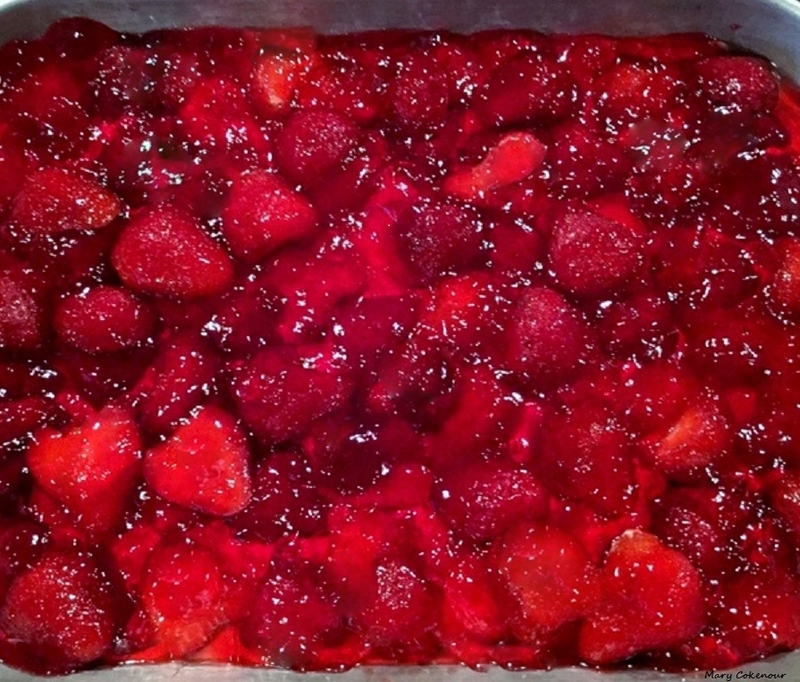 Pour mixture over the cream cheese layer; spread out berries if necessary. Cover baking dish with plastic wrap and refrigerate a minimum of four hours if serving the same day; or overnight if serving the next day. Note: This recipe can be created with other berry Jell-O flavors with accompanying berries such as raspberry, blackberry, cherry or blueberry.